What seems to be your issue? Simple Really. We earn commission for purchases you make at our listed online stores and we pass back most of the commission to you as cashback! Check out our video below or visit the how it works page to learn more. How much time does it take to get the cashback? For every purchase through Nitrogem, the online store pays us a commission, which we pass to you as cashback. This process typically takes 8-12 weeks as we have to wait for the store to confirm that the purchase was not returned or exchanged. We constantly work with our online store partners to reduce the wait period. However, to be safe, we inform you that it usually takes 8-12 weeks for the cashback to be confirmed. In case your cashback is pending for more than 90 days, visit our contact us page to file a claim under "Cashback Pending for Too Long"
At what stores can I get the cashback? You would get the cashback when you shop at the online stores listed on Nitrogem's website. We have partnered with 200+ online stores across all categories, which includes all of India's top online stores! Is the cashback over and above the discounts at the online stores? Yes! Nitrogem's cashback is over and above all the discounts (with or without coupon codes) that the online stores provide!! How can I ensure that I get my cashback for my purchases? Make sure that the shopping cart of the store is empty before you start shopping. If it is not empty, clear the contents of the cart and visit the store through Nitrogem again. What happens if I return, cancel or exchange my purchases through Nitrogem? Returned or cancelled orders will void the cashback earned and your pending cashback balance would be reduced. Exchanged orders may void the cashback depending on the store's policy. Would I get the cashback on all products of the stores listed on Nitrogem? Under what circumstances would my pending cashback be cancelled? 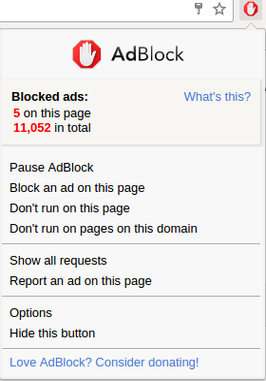 How can I disable Adblock on my browser? To ensure you receive cashback on your shopping transaction, we recommend that you completely disable ad blocking software on your browser before making your online purchase. Follow the instructions below to do so and enjoy your shopping experience with Nitrogem! If you have AdBlock installed on your browser, you can disable it during your shopping session. To do so, click on the Adblock extension icon in your browser toolbar and then, click on "Pause Adblock" to disable Adblock temporarily. Then, reload Nitrogem's page and continue shopping to avail your cashback. You may click on "Unpause Adblock" after your shopping session to restore using Adblock. If you have AdBlock Plus installed on your browser, you can disable it during your shopping session. To do so, right click on the Adblock Plus extension icon in your browser toolbar and then, click on "Manage extensions". Then uncheck the "enabled" checkbox next to the Adblock Plus extension. Finally, reload Nitrogem's page and continue shopping to avail your cashback. You may click on the "enabled" checkbox again after your shopping session to restore using Adblock Plus. If you have any other ad blocking browser extensions installed, we recommend that you follow the same steps as for Adblock Plus above to ensure you receive your cashback. Can the pending cashback amount change when confirmed? Yes, pending cashback amounts are indicative and subject to change after confirmation from the online store. This is because when a purchase is tracked, most online stores do not provide us all the information required to accurately estimate the cashback amount. For example, the cashback may vary based on whether you are an existing or new user at the online store. Also, the platform used for purchase (e.g. mobile app, desktop, etc.) and the category of the product purchased may also affect the cashback. Many pieces of this information is made available to Nitrogem only after the cashback confirmation and so the pending cashback amount is an estimate and subject to change. In case you believe, your cashback was confirmed for an incorrect amount, please visit the contact us page to file a query under "Cashback Confirmed For Incorrect Amount". My cashback has not been tracked yet, what should I do? If you had followed the steps and your cashback has not been tracked for over 48 hours, please visit the contact us to file a claim under "Cashback Not Tracked". Pending Balance is the cashback amount that has been tracked but not yet received. After the store confirms that the purchase was not returned or exchanged, this pending balance would become available balance. There may be some differences in the amounts of pending and available balance as explained here. Available Balance is the amount that you can transfer to your bank account or mobile wallet or redeem against gift vouchers immediately. How does my Pending Balance become Available Balance? Pending Balance earned from purchases made at online stores typically takes 4-8 weeks before it becomes Available Balance as we have to wait for the store to confirm that the purchase was not returned or exchanged. Can Available Balance in my account expire? Don't worry, your Available Balance at Nitrogem never expires! You can transfer or redeem it any time you want. How can I withdraw or redeem my Available Balance? At Nitrogem, you can transfer your Available Balance to your bank account or mobile wallet. Alternatively, you may redeem your Available Balance in the form of shopping vouchers at your choice! What is the minimum withdrawal limit? You can withdraw or redeem a minimum Available Balance of ₹100. Is there any fee or deduction when I transfer or redeem my Available Balance? Absolutely not! Nitrogem bears all the costs associated with transferring your Available Balance to your bank account, mobile wallet or shopping vouchers. There is no cost or fee that you have to bear! Can I transfer my Available Balance to another Nitrogem account? When you sign up with Nitrogem, you get a Welcome Bonus of ₹50 added to your Available Balance. No conditions, just sign up for free and avail your welcome bonus! I signed up using Google, can I switch to Facebook? Sorry, we do not allow switching accounts between Google or Facebook. To change your profile, click on the menu on the top right corner and then click settings. How do I manage my email subscriptions? You may subscribe or unsubscribe from your email subscriptions by clicking on the menu on the top right corner and then clicking settings. In the email subscription section, you may choose to subscribe for emails on offers within specific categories and we'll keep you up to date on your preferred offers! How do I list my online store business with Nitrogem? How do I close my account at Nitrogem? Awww, we will miss you! Currently, there is no feature to de-activate your Nitrogem account. However, you may unsubscribe from all Nitrogem emails by clicking on the menu on the top right corner and then clicking settings.